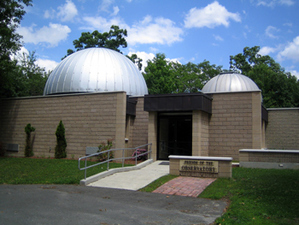 Western Connecticut State University will host evening shows and viewings of planetary and stellar objects during public nights from Sept. 8 through Dec. 15 at the WCSU Planetarium and Observatory on the university’s Westside campus, 43 Lake Ave. Extension in Danbury. The nine Saturday evening presentations will include a one-hour planetarium show followed by telescope viewing of prominent features in the night sky including the moon, several planets and star systems, clusters and nebulae visible during the autumn months. The WCSU Observatory, located atop a hill near Pinney Hall, offers viewings through a 20-inch, computer-controlled Ritchey-Chretien reflector telescope. Admission is free and the public is invited. Limited parking is provided adjacent to the observatory, with additional parking available on University Boulevard. Planetarium shows are appropriate for adults and older children and will be canceled only in the event of hazardous road conditions or severe weather that would pose a safety risk. The viewing period will not be offered during public nights when cloud cover prevents sky observations. For updates to confirm plans for a scheduled public night, call (203) 837-8672 on the day of the event. Sept. 8: The planetarium show will start at 7 p.m., with sky observation following from 8 to 10 p.m. Visible objects will include the M13 star cluster, the Ring Nebula, the double star Albireo, Saturn and Mars. Sept. 15: The planetarium show will start at 7 p.m., with sky observation following from 8 to 10 p.m. Visible objects will include the moon near first quarter, Saturn, Mars and the star clusters M11 and M15. Sept. 29: The planetarium show will start at 6:30 p.m., with sky observation following from 7:30 to 9:30 p.m. Visible objects will include Saturn, Mars, Neptune, Albireo, the Ring Nebula and the Epsilon Lyrae star system. Oct. 6: The planetarium show will start at 6:30 p.m., with sky observation following from 7:30 to 9:30 p.m. Visible objects will include Mars; the star clusters M11, M15 and M2; and Neptune. Oct. 20: The planetarium show will start at 6 p.m., with sky observation following from 7 to 9 p.m. Visible objects will include the waxing gibbous moon, Mars, Albireo, the Ring Nebula and Epsilon Lyrae. Nov. 10: The planetarium show will start at 4:30 p.m., with sky observation following from 5:30 to 7:30 p.m. Visible objects will include Neptune, the M2 star cluster, Uranus, the M31 galaxy and the Perseus double cluster. Nov. 17: The planetarium show will start at 4:30 p.m., with sky observation following from 5:30 to 7:30 p.m. Visible objects will include the moon near first quarter, Mars, Neptune, Uranus, the M31 galaxy and the Perseus double cluster. Dec. 1: The planetarium show will start at 4:30 p.m., with sky observation following from 5:30 to 7:30 p.m. Visible objects will include the M31 galaxy, Neptune, Uranus and the Cassiopeia star clusters. Dec. 15: The planetarium show will start at 4:30 p.m., with sky observation following from 5:30 to 7:30 p.m. Visible objects will include the first quarter moon, Neptune, Uranus, the Gamma Andromedae star system and the Pleiades star cluster.